Did you ever tried installing documents, presentations, excel files and PDF files in your Windows Phone? Most of us will not find any option to do so. Microsoft Zune is only used for adding Music, Video, Pictures and Podcasts. Then what about adding docs and PDF files ? Well, you have to use another way to load your documents and files in windows phones. The simple way to install all your files in your phone is by using Skydrive. This application is the only possible way to open your documents, PDF files and any kind of readable materials in windows phone. To install and use Skydrive, there is a small procedure which you have to follow. So, kindly be patient to read the article for a better installation. The first thing you have to keep in mind that, for any task windows phones will depend on your windows live id. which is nothing but your email id of Hotmail, and windows live. You have to keep your windows id live to make any sort of requests and responds to windows phones. So, since you got your windows id, the first step begins here. 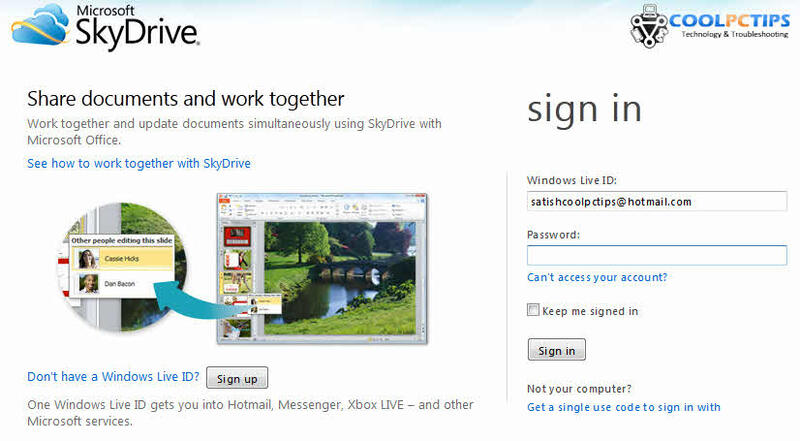 Step 1: Login to your Skydrive Account with your windows live id. If you are logging in for the first time, Don’t worry if you see a messenger wall in your account. It will just embed your all Facebook, Twitter and other updates from your phone and give you a warm welcome. Step 2: After logging in, you can see 3 default folders like below screenshot, these are the folders where you can add your documents and files of your choice. You can also make your own folders and rename them accordingly. Step 3: Now select documents folder to add your MS-Word, MS-Power Point, MS-Excel, Text, PDF Files. You can just drag and drop the files into these folders from your desktop. The same way you can add your Pictures in Skydrive to open from your phone. Once you have finished adding all your files, Just logout and get back to your phone. Step 4: Now download Skydrive app from market place in your windows phone or connect your windows phone to Zune to install the app via PC. Skydrive is a free application to download and use. So, no need to worry about the price. Step 5: After Installing the app, you can find Skydrive in your windows mobile. Just open it and you can find all your installed documents and files in it. Step 6: Open any file or document from your windows phone to check whether your documents are opening or not. If not, install again via same process mentioned in step 1,2,3. You can also check out our exclusive video on how to add and sync your documents in windows phones. I hope you understood how to add your docs and PDF files in windows phones. If you still have any queries,, you can always leave a comment below. Sleep – A Windows Phone App to Make You Sleep Instantly! This is simply Uploading a file (format irrelevant) to the CLOUD. There is presently NO WAY to SYNC a pdf file to WP7~! You want to open it again in 1/2 hr? YOU HAVE TO DOWNLOAD IT AGAIN~! Once you have transferred your files to Skydrive, is there any way to copy those files into your Lumia phone in batches, instead of having to open each one and then having it “save as” into your phone? It’s a hell of a job doing it one file at a time. I want to have my files (and I have many) accessible in my phone without having to connect to the internet everytime. One of my considerations in getting a WP7 phone was being able to access my files using Word and Excel. Now I realize it’s such a pain just to transfer my files. I can’t imagine what was going on in the minds of Microsoft when they designed WP7 this way. Nice article bro…it helped me alot.! thanks. and please do update these kinda issues about Lumia and windows mobile 7.5 !! I have installed the Skydrive in mobile from Nokia Apps. I have uploaded the PDF files to Skydrive from PC and Tried to download the PDF to Mobile from skydrive, but unsuccessfull. error msg : This is document cannot be opened beacuse it is not a valid pdf file . Anything you can help me out regarding this. Thanks for the tip but I would like to know if this can be done in reverse. I have a few saved pdf’s saved on my phone that i would like to transfer to my laptop. Any help would be greatly apreciated. Thanks. but there is no options for download the whole folder. every time we have to connect the internet. very stupid , microsoft and nokia. It always wants Internet connection . . .
Helo brother,i hv installed adobe reader in my lumia 800,i hv transferred some pdf file into my sky drive account,but still i cant open them,woud u plz like to help me,how can i open them? Which model are you asking for? how to transfer pdf files from nokia lumia 520 to pc /laptop without using skydrive…………. When I transfer PDF files via sync cable between Windows 8.1 PC and Nokia 520 (Windows Phone 8) the document has words partially missing, for example Doctor becomes ctor. Any Ideas? Does this happen with all files? No only PDF files, I forgot to mention that it also happens when I transfer to my Kindle reader as well. Sounds like an embedded texts issue. Are you using Adobe Acrobat Reader? I have installed adobe reader app on my lumia 520. when I open documents in adobe reader, how can I read or share these documents on my laptop or desktopor other device. There will be a share option on the file, you can either mail it, send it via Bluetooth or upload it to your cloud for sharing.